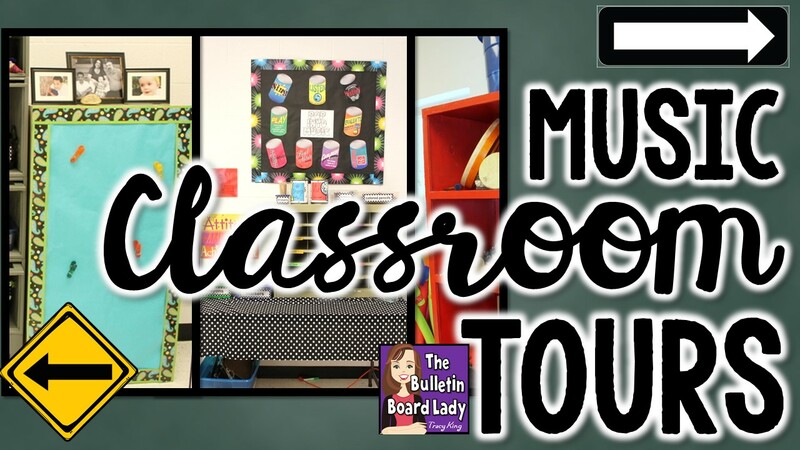 I am in a new classroom this year and would LOVE to take you on a tour of my new space. This year I'll be teaching 3rd through 5th grade music. My room is much smaller than all of the rooms that I have taught in before, so I've had to reconsider what things are the most important to me and arrange my room accordingly. 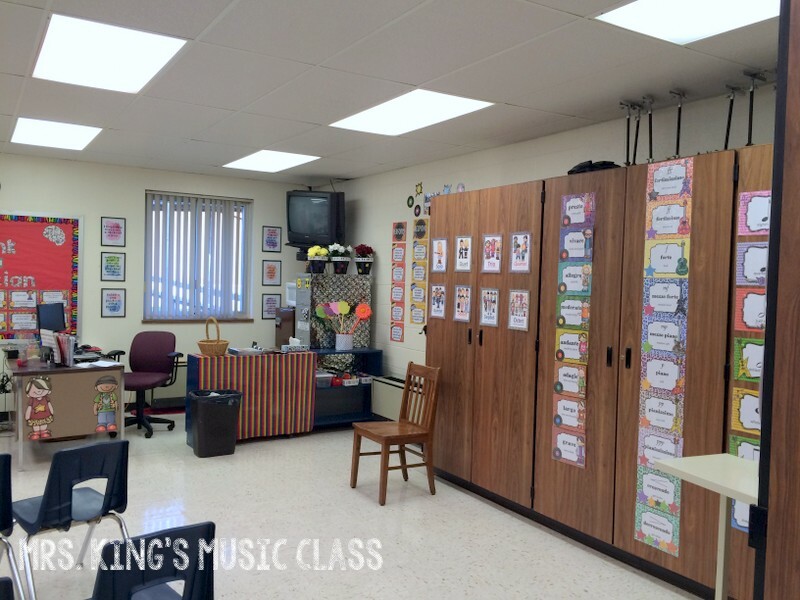 This is one view of my classroom from the door at the back of the room. I have chairs arranged in a style that Fred Jones would be proud of. 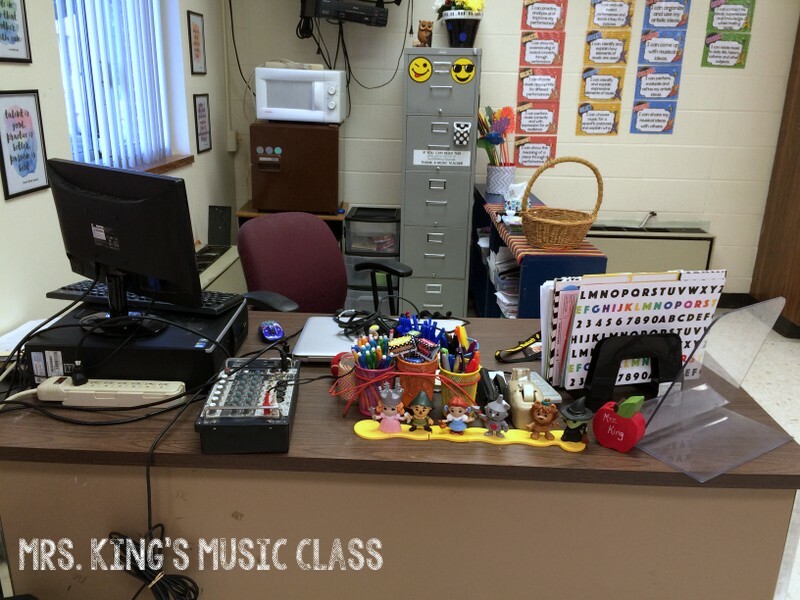 This arrangement lets me be near any student in class with just a few steps. 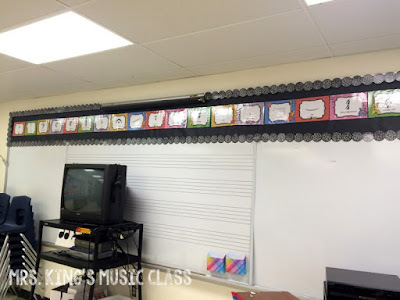 It also makes dividing for singing parts or creating small groups pretty easy. This is the other side of my room. I've set up a teacher corner where I have my teaching supplies, office supplies, filing cabinets and some personal space. There are more pictures of this area below. On many of the storage cabinets I have placed sets of posters. To some, it may look like there is just TOO much stuff up, but I have a plan. 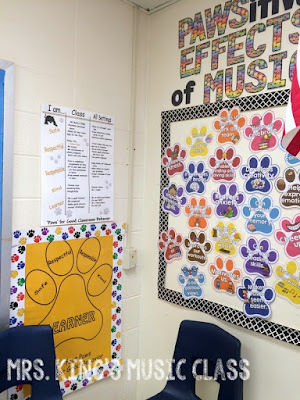 I am a big fan of workstations and I plan to set workstations up near the posters sets so that students will be able to use them as a reference. 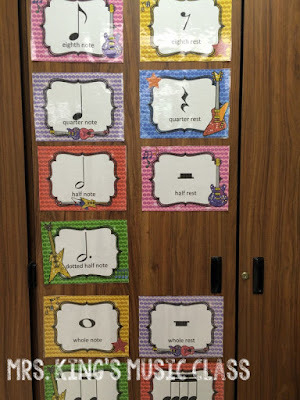 For example, this awesome set of elements of music posters (by Sara Bibee) would be a great place for students work if they are completing listening journals. 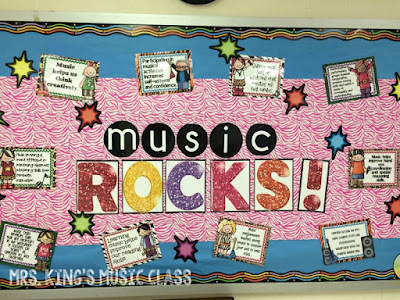 I'm using a rock star theme in my classroom as our school theme is "stars". 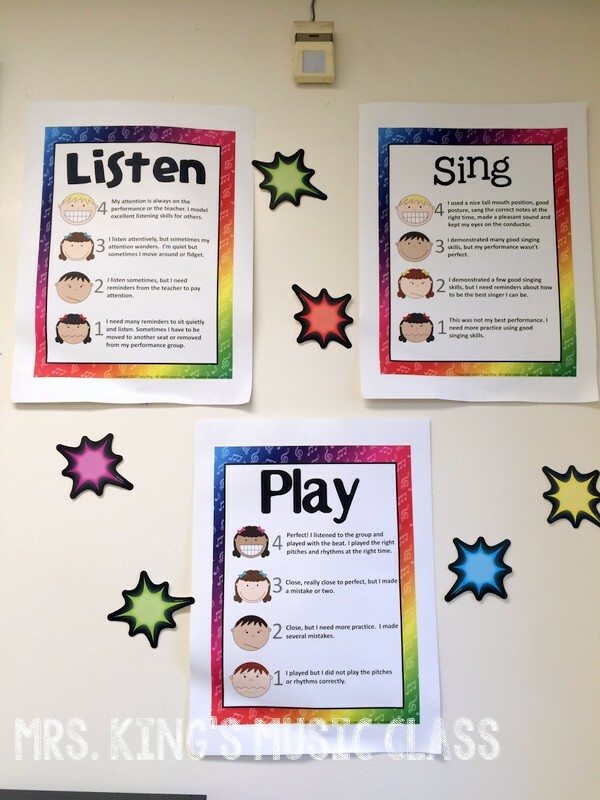 This is a set of tempo posters (love that glitter!) 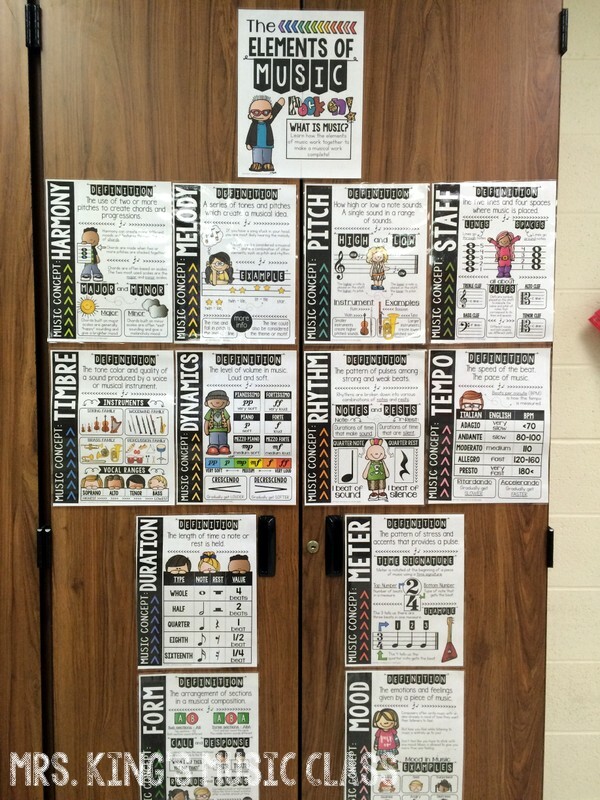 and below are some notation posters. They are part of my music symbols set. This would be a great place for a workstation that focuses on rhythm or composition. The notation posters will be a great reference. Get the tempo posters HERE. Get the music symbol posters HERE. Also on the storage cabinets is a set of dynamics posters and these ensemble posters in a rock star theme. 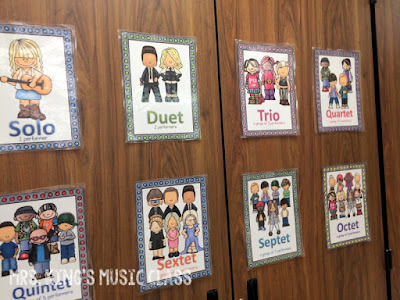 The kids generally giggle at "sextet" and open house even a few parents! 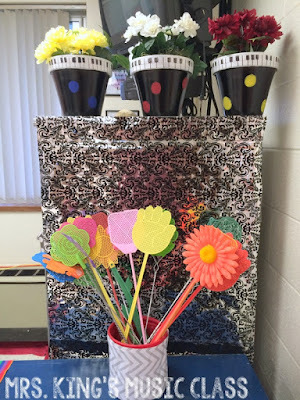 This is a great reference for students as we discuss vocal and instrumental ensembles. Get the dynamics posters HERE and the ensemble posters HERE. 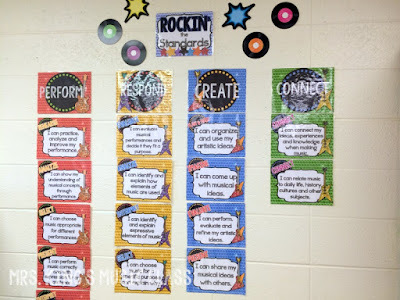 I'm loving this set of Rockin' the Standards posters using the new national standards. 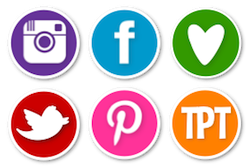 They are color coordinated so that even if I didn't place this in these obvious columns that you would be able to see which "I Can" statements go with each action. These may be more of a reminder for me. than my students at first, but I am okay with that. 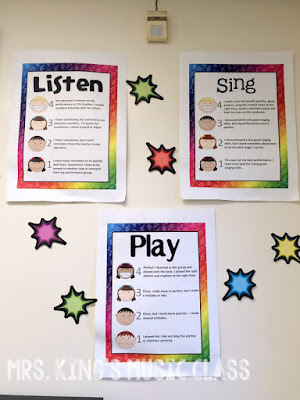 These are near my teacher's corner so they will be a great reference for me as I do my lesson planning. I'll also use this area to set up workstations so students will have more of an opportunity to read them then. This is my teacher corner. The bookshelf that has the rainbow material covering stores my office supplies (paper, binders, blank CDs, etc...) as well as a few teaching resources. The open part of it is where I have some supplies that students will use occasionally like bean bags, hole punches, scissors, etc... 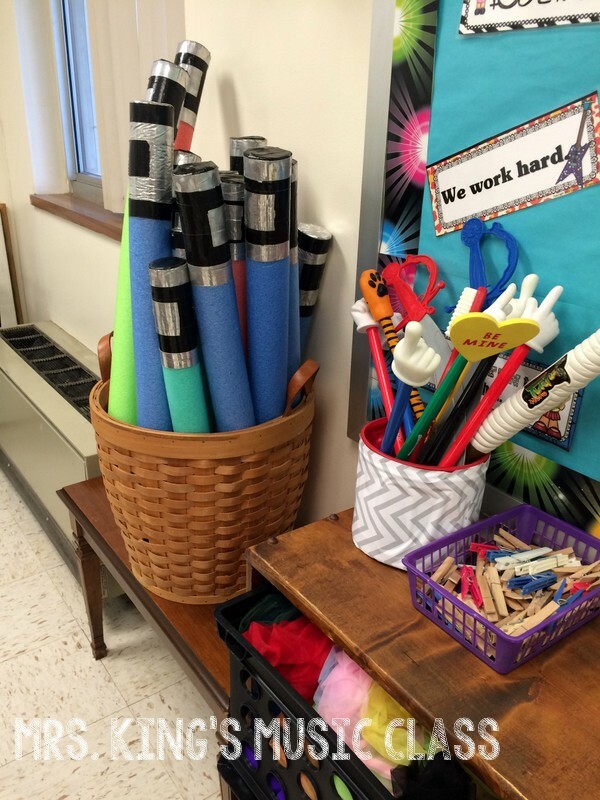 I don't want to put them in my writing center unless they need them to keep that area tidy. On my desk are two large rockers. These are from a set of clipart from Melonheadz. I used BlockPosters.com to create them at this size thanks to a great tutorial by Jena at Sew Much Music. Around my windows are some framed watercolor quotes about music. They were created by Melody Payne. 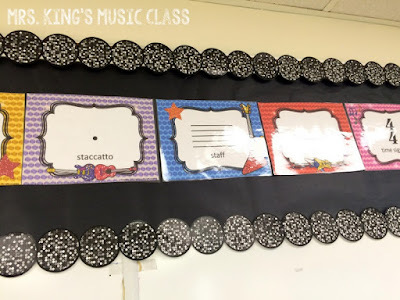 The frames are inexpensive frames from the dollar store and are attached with Command Strips. On the side of my tall filing cabinet I attached some textured wrapping paper. The flower pots are a Pinterest project and are filled with fake flowers because I have a brown thumb. My collection of flyswatters is stored in a coffee can that I've covered in contact paper. 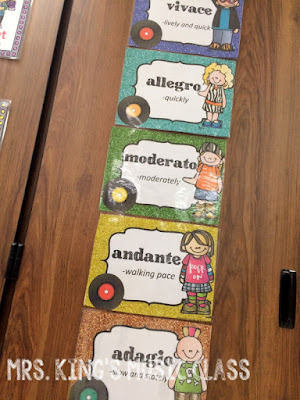 We only use them occasionally so I didn't want them to be in a prominent place in the classroom. It is hard for kids to resist touching them. Okay...me too. Also in my teacher corner is a mini-fridge and microwave. All the comforts of home! I keep lots of water and Diet Mt. Dew in there. It is also night for evenings when I have to stay late for events. 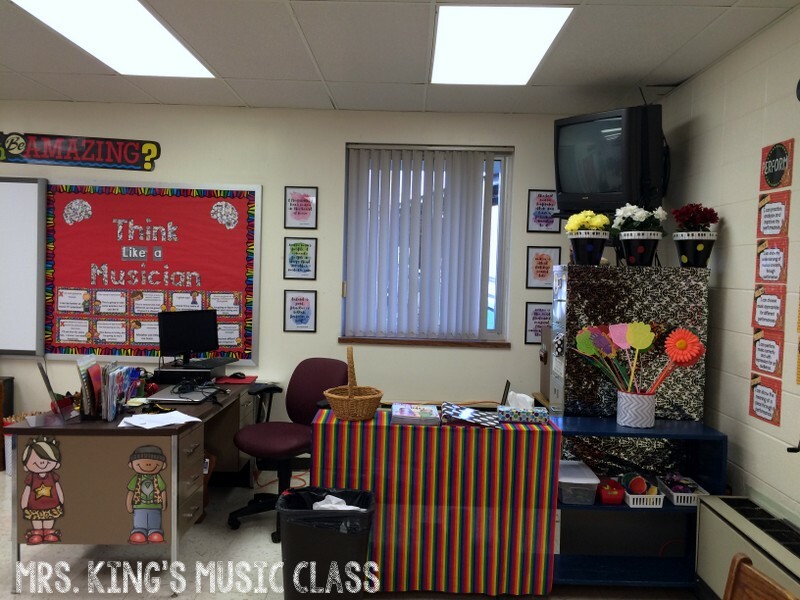 This is the front of my classroom. 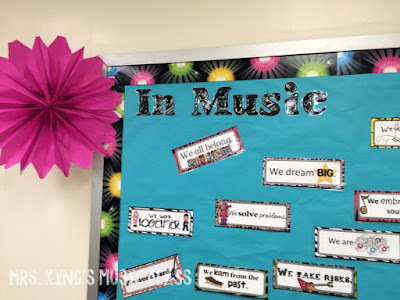 "Think Like a Musician" is a growth mindset bulletin board with a music twist. 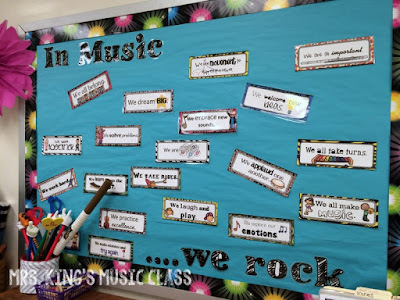 The other bulletin board is "In Music We Rock" which could double as classroom rules. This big pink flower was created with pink, paper bags and a bit of hot glue. Near this bulletin board is where I keep some of my more frequently used props, pointers, scarves, etc... The pool noodles are my steady beat swords. 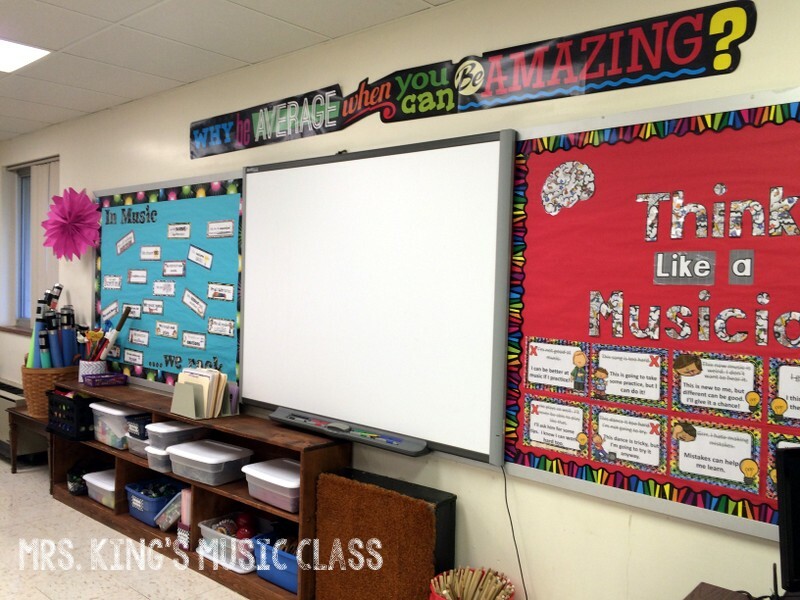 My daily points and performance assessments in music all use 3-4 point rubrics. These posters have the descriptions of what I'm looking for. 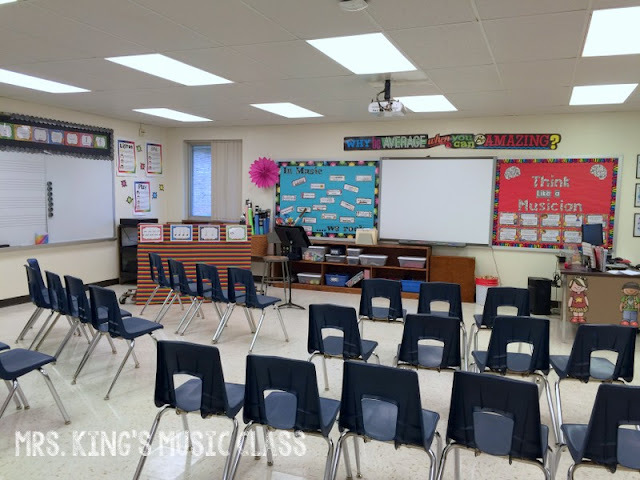 Right now they are in the corner of the room, but I think I may end up moving them to a position that is a little closer to the students so that they can read them from their seats. You can get the small versions of these posters HERE. This is the first classroom that I have had that has had one of those long, skinny bulletin boards above the whiteboard/chalkboard area. 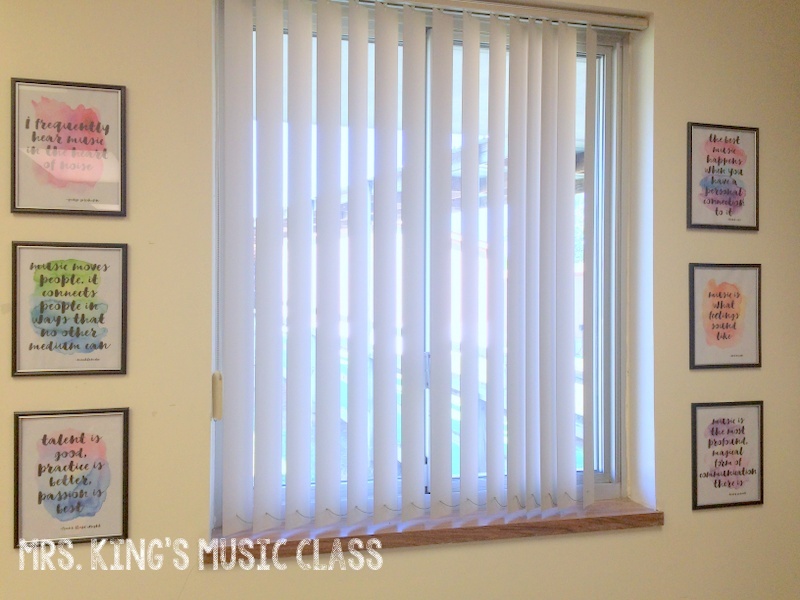 Turns out that my music symbol posters look great there! 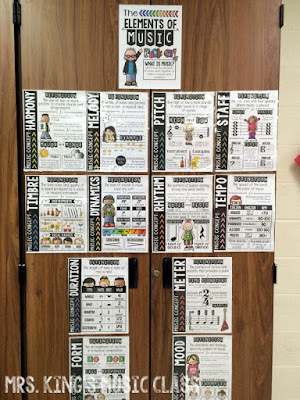 They are also in a great position for me to use when teaching. A close up of those posters. 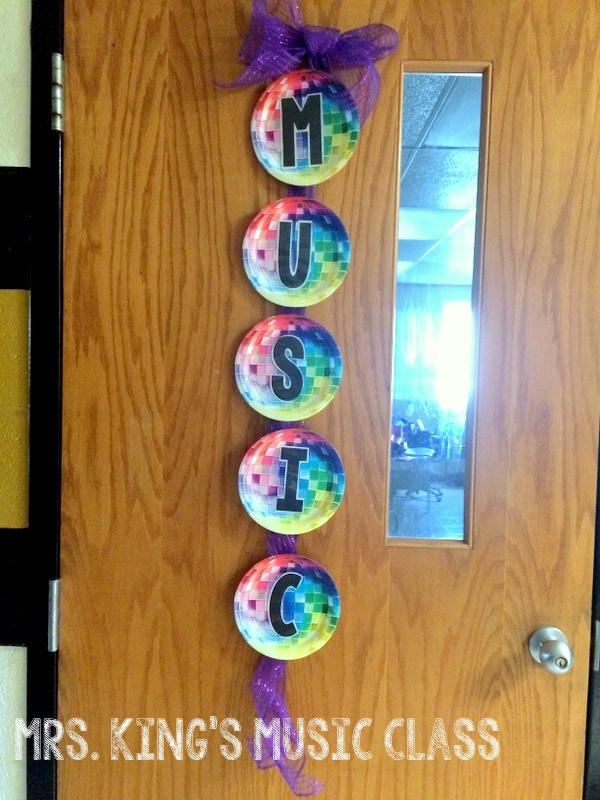 The cool, black, disco looking balls are actually a border that I found at the teacher store. This is my PAWS corner. 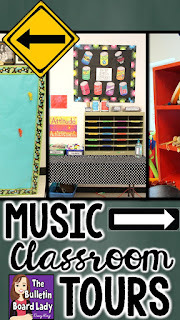 PBS expectation posters and my PAWsitive Effects of Music bulletin board go here. This will also be one of the areas that I use for setting up centers. This is one of my favorite bulletin boards! 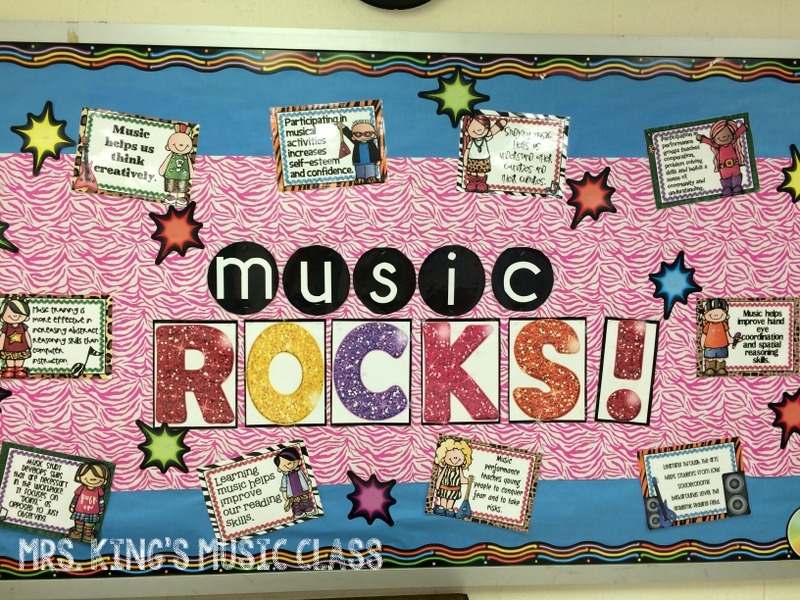 This is Music Rocks and is basically a music advocacy bulletin board. I used some pink, zebra striped wrapping paper as part of the background to add more interest. The sparkles that you see here and in other parts of the room were all part of a collection of 70s themed decorations I found at the teacher store. Outside my door is this cute little sign. It is created with disco ball paper plates (from the party store), some purple mesh (the kind that crafters use to make wreaths), letters I printed from my computer and tape. Simple, but eye catching! 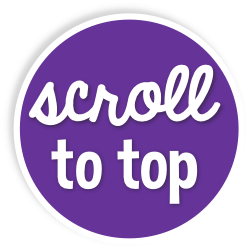 I enjoy this blog. It doesn't look like you have any tables in your room. Where to kids do any written work? We use clipboards. I'm new to this school so they were being ordered when this picture was taken. This is wonderful qork- especially considering how little time you had, friend! As always, I'm amazed!